A new paradigm, which models the relationships between handwriting and topic categories, in the context of medical forms, is presented. The ultimate goals are: (1) a robust method which categorizes medical forms into specified categories, and (2) the use of such information for practical applications such as an improved recognition of medical handwriting or retrieval of medical forms as in a search engine. Medical forms have diverse, complex and large lexicons consisting of English, Medical and Pharmacology corpus. Our technique shows that a few recognized characters, returned by handwriting recognition, can be used to construct a linguistic model capable of representing a medical topic category. 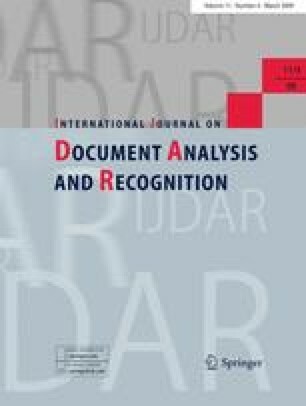 This allows (1) a reduced lexicon to be constructed, thereby improving handwriting recognition performance, and (2) PCR (Pre-Hospital Care Report) forms to be tagged with a topic category and subsequently searched by information retrieval systems. We present an improvement of over 7% in raw recognition rate and a mean average precision of 0.28 over a set of 1,175 queries on a data set of unconstrained handwritten medical forms filled in emergency environments.